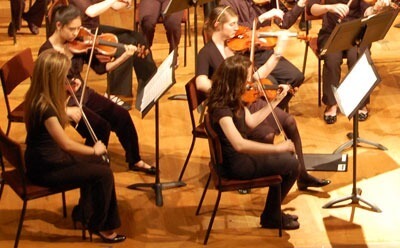 CSA Sinfonia members play during a recent concert. Two upcoming concerts promise great music from two high school ensembles in the NIU Community School of the Arts. Both concerts begin at 7:30 p.m. and are in the Boutell Memorial Concert Hall in the NIU Music Building, which is accessible to all. The music is challenging and fun for the students and will be a treat for the audience. The concerts are free and open to the public. On Wednesday, Oct. 27, under the direction of Linc Smelser, the CSA Sinfonia performs “Danse Macabre” by Saint-Saens, “Symphony No. 2” by Borodin and “March from the Love of the Three Oranges” by Prokofiev. Also on the program are “Penny Lane” by the Beatles, featuring Mark Baldin on piccolo trumpet, and this year’s IMEA District piece, “Academic Overture” by Brahms. On Sunday, Nov. 7, under the direction of Donnie Norton, the CSJazz Band, performs “C Jam Blues” and “Limbo Jazz,” by Duke Ellington, “Moanin’ ” by Charles Mingus, “Flight of the Foo Birds” by Neal Hefti, “On the Sunny Side of the Street” by Fields/McHugh and “Ain’t Misbehavin” by Thomas “Fats” Waller. Admission to both ensembles is by audition only. Auditions for next year’s groups are in May. Smelser is musical director of the Kishwaukee Symphony Orchestra. In addition to directing CSA Sinfonia, he also directs the community school’s string orchestra, Symphonette. A sought-after cello teacher and performer, he performs regularly with the Grant Park Orchestra in summer and with the Chicago Symphony as a regular substitute player. Norton graduated from NIU with a bachelor’s degree in jazz studies and has a master’s degree from the New England Conservatory of Music. He teaches in the Chicago area and has directed the CSJazz Band for the past two years. He is a saxophone performer and teacher and taught at the NIU Jazz Camp in 2010. For a complete listing of upcoming recitals by students in the community school and for more information about the many ensembles, classes and lessons in music, art and theater offered by the NIU Community School of the Arts, call Renee Page at (815) 753-1450.